Ottawa artist Nicole Amyot at work at the junction of King Street and Queensborough Road this past Saturday – a perfect fall day for plein air painting. “What can be going on at the end of King Street?” I wondered as I saw the vehicle parked near the former Anglican Church, classical music coming from it. “Well that’s something a little different,” said I to myself, curiosity aroused. But I need to complete my brief Bosley Road mission before checking it out. Beside the parked van an easel had been set up, and an artist was at work. It was something I hadn’t seen since my long-ago childhood in Queensborough. It was an artist at work, painting a Queensborough scene! People, this is something that was a lovely part of my long-ago childhood here in Queensborough, but that I hadn’t seen in all the years since. My heart leapt with joy. For those who don’t know the story of Queensborough’s close connection with (mostly) amateur artists back in the middle of the last century (when all the world was young), I refer you to a post I did on that topic here. The brief version is that in the 1960s and ’70s, artists Mary and Roman Schneider – both refugees from war-torn Eastern Europe – ran the Schneider School of Fine Arts in the hamlet of Actinolite, which along with Queensborough constitutes the sum total of clusters of settlement (and, once upon a time, commerce and industry) in Elzevir Township. 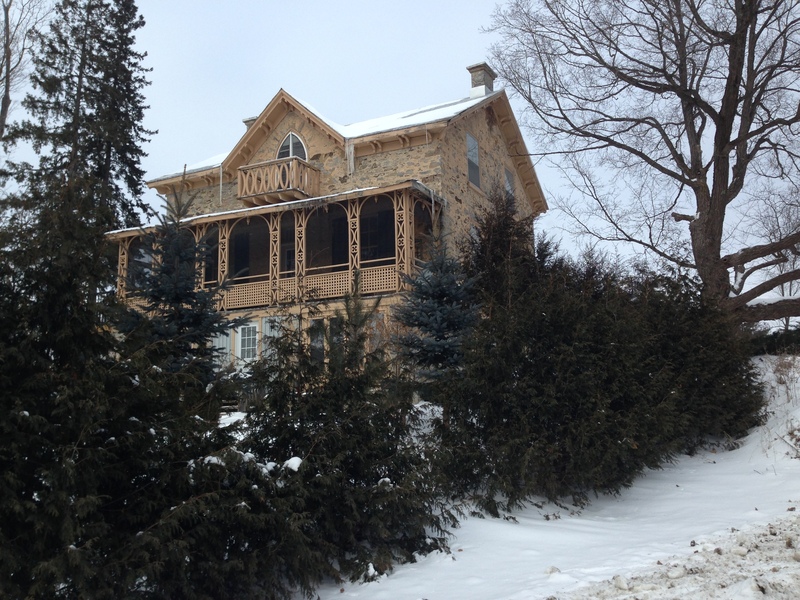 Art students from all over Ontario and beyond would come to the Scheider school for a few days at a time, sleeping in rustic cabins and visiting scenic spots to set up their easels and sketch and paint. Pretty, historic little Queensborough was, needless to say, a favourite destination, and when I close my eyes I can still picture my eight-year-old self peering over the shoulder of one of the artists as he or she worked, and catch the distinctive scent of the oil paint. To me it is a magical memory. And this past Saturday, that magical memory came to life! Nicole Amyot at work on her painting of the dam on the Black River and the historic mill that is the heart of Queensborough. Of course I stopped and spoke to the artist, who was Nicole Amyot of Ottawa. (The driver of the van, her good-humoured and patient chauffeur who waited and listened to the music as she worked, was her husband, Ron.) Nicole was working as quickly as she could, and didn’t stop working as she chatted, but was patient and friendly as she answered my questions. It turned out that she was revisiting her own past, just as her presence allowed me to revisit mine. She had first come to Queensborough, she told me, about 40 years ago as a student at – you guessed it – the Schneider School of Fine Arts. Throughout the years since she has continued as a painter, though she modestly but firmly told me that she does not consider herself a professional artist. Remembering the scenes she had painted all those years ago, she and her husband had made a weekend excursion back here, lodging overnight in nearby Tweed and stopping at two or three places for her to paint those scenes once again. Work in progress: Nicole Amyot’s not-yet-complete picture (in acrylics) of the mill and dam in “downtown” Queensborough. The painting that Nicole was working on was a scene that is pretty much the heart of Queensborough: the Black River running over the dam that once upon a time provided the water power needed for the sawmill and grist mill that still stand alongside it. (The mill too is in her painting.) It was a joy to once again watch a talented artist skillfully and quickly reproduce a pretty Queensborough scene on canvas, to see her artistic judgement at work as she considered what and what not to include, and how best to represent what her eyes were seeing. I didn’t want to bother Nicole or slow down her work, so I made my stop brief. As a trained journalist, however, I of course collected her phone number so I could make contact again if need be. Some of the people who have worked so hard to save Madoc Township Public School (at left, from left, Margaret Heard, Wendy Spence and Amy Beaton) offer handshakes and heartfelt thanks to school-board trustees (in foreground is Dwayne Inch; behind him is Jim Patterson, and half-hidden while shaking Amy’s hand is Mary Hall) this evening for their unanimous support of keeping MTPS open and returning to it students in Grades 7 and 8. Call it a victory for rural education. Call it the best-case scenario for the children of Madoc, Elzevir and Tudor and Cashel townships. Call it a huge shot in the arm for our local economy and way of life. Call it whatever you like. We have something to celebrate. The boardroom was filled to capacity for this evening’s final votes by the school board on the future of quite a few schools in Hastings and Prince Edward counties. Many supporters of Madoc Township Public School were among the crowd. This is an astounding outcome, and one that even the most optimistic among us campaigners for MTPS barely dared think about, let alone hope for, during these past six months. Centre Hastings Trustee Bonnie Danes (left) was all smiles after this evening’s board meeting, as supporters of Madoc Township Public School, including recent MTPS grad Brooklyn Gylyktiuk (right foreground) and her mum, Wendy Spence, thanked her for her tireless work. Every single one of the trustees on the board gets my huge thanks – and I hope yours too – for this vote of confidence in our school and our community. But I’d really like to single out Centre Hastings Trustee Bonnie Danes, who I think I’m safe in saying spearheaded the work behind the scenes at the board level in pushing for MTPS’s continued existence. I am sure that Southeast Hastings Trustee Justin Bray worked really hard on this one too. Trustees Danes and Bray: thank you so much! Some of the core group of Madoc Township Public School supporters and activists who made it happen: from left, honorary member Brooklyn Gylyktiuk (an MTPS grad), plus some of the main crew: Wendy Spence, Margaret Heard, Randy Gray, Denise Gray, Holly Kormann, Amy Beaton – and, I feel shy to say and very honoured because they asked me to be in the photo, me. Well, we know that MTPS will be open for business this coming September, welcoming students from junior kindergarten to Grade 8. That is just amazing. And wonderful. And I think we should have a party! Maybe now; maybe in September. Whenever: a time for kids, parents and the community at large to gather on the five-plus acres at Madoc Township Public School for an afternoon or evening of kids running and jumping and exploring and playing soccer or softball or tag or hide and seek, parents taking photos and refereeing and chatting and enjoying the outdoors, and community members sharing their memories (old or new) of happy times at MTPS. With hot dogs and lemonade and conversation and smiles and tears of joy. Wouldn’t that be fun? But in the longer term (and by that I mean only the very slightly longer term, i.e. starting pretty much now), I think it behooves all of us – parents, community members and MTPS students and supporters – to step up and show our ongoing support. I’m speaking only for myself here, but maybe I’m not alone in having realized that until six months ago, I took Madoc Township Public School for granted. It was there, it was a great school and a great asset to our community, and I assumed it would continue to be all of that. And then we almost lost it. As Joni Mitchell says: “Don’t it always seem to go that you don’t know what you’ve got till it’s gone?” Now, I think we did know what we had; but maybe we weren’t doing everything we could to ensure our community would continue to have it. The confidence the trustees have shown in our school inspires me to do everything I can to ensure the community in turn does everything it can to support MTPS. Ways we can help that come to mind immediately are fundraising for playground, library and other school equipment and resources; assistance in establishing after-school care to help working parents; and support for outdoor-education programs that take full advantage of our school’s unparalleled green space. But I’m sure there are many other ways we can continue and expand our support. I really mean that, and I hope others in the community will feel the same. If we want to continue to have this splendid school in our community, we can’t take it for granted; we have to work for it! And the more we do to help and improve our school, the greater its success will be – and the more assured will be its continued existence. This is our school – and I am so proud of it! One area that I feel strongly about is support for the school library. When I was a kid attending that brand-new school back in the 1960s and ’70s, it had a wonderful library – lots of books, comfy chairs, a welcoming ambience; it made you want to just curl up and read and read and read. Among my happiest memories of MTPS days are exploring all the books on the shelves, learning how they were categorized and shelved, and taking advantage of the newfangled (hey, it was the ’60s) audio-visual equipment. When I returned to MTPS for its fantastic 50th-anniversary celebration in 2011 (even before Raymond and I had bought the Manse and I resumed my childhood Queensborough connection), I was a little sad to see that the beautiful library space had been chopped up and turned largely into a computer lab, with a much-reduced library parked in a former classroom. If someone asked me tomorrow to head up a fundraising campaign to support and improve that library and the experience it offers the kids of MTPS, I would accept in a heartbeat. And this from someone (me) who is seriously lacking in free time – but aren’t we all? Hey, what can you do to support our school? Please think about it. Our community has just received a priceless gift: our school, saved and supported. Let’s pay it forward by doing everything we can to make Madoc Township Public School even better, and in the process ensure a brilliant future for it, our kids and the rural place we are so proud to call home. Our terrific rural school, Madoc Township Public School. Please let’s not let this be its final year of educating students from our community! I am deeply indebted to another writer for most of the words that appear in today’s post. They are important words. They are about the future of the local public school that serves us here in Queensborough: Madoc Township Public School. And they are by extension also about the future of our rural community as a whole. Because really, is there anything much more important to a rural community than a school for that community’s children? A good school is one of the key factors attracting families to any area. We live in a time when several things – sky-high hydro rates, far-from-universal access to high-speed internet, and a shortage of other important services – are working against development, growth and prosperity in rural Ontario. Now, I am not one of those who despairs about that situation; I actually think we live in a time of great promise for our rural way of life. After the big migration from the country to the urban areas of this province that took place over the past 40 years or so, people are beginning to recognize that there is a very great deal to be said for living where there is space, and beauty, and fresh air, and neighbours you know who help you out when you need it. Central Hastings County, where Queensborough is located, is attracting more and more smart and creative people who appreciate our way of life – and those people include some families with young children. But we could use a lot more of those young families. And closing our local school – as the Hastings Prince Edward District School Board, admittedly facing some big financial challenges, is proposing to do (as you can read here) – is not, in my humble opinion, the way to go about it. Our community school’s simple and excellent motto (devised in the years I attended it): “Friendship and Learning.” Well said. In a recent post I let you know about a very important event that is happening tomorrow evening – Tuesday, Jan. 17, 2017. It’s the first public meeting in the process the school board has set up to consider and decide on its proposal to close Madoc Township Public School and bus its students from our community (Madoc Township, Elzevir Township [that’s where Queensborough is] and Tudor and Cashel Township) to Madoc Public School in the village of Madoc. Madoc Public is a great little school, don’t get me wrong; many years ago, when I was growing up here at the Manse, I attended Grades 7 and 8 there, after doing Grades 1 through 6 at Madoc Township Public School. But the “town” school is already quite full, it has extremely limited playground space (whereas the playground at Madoc Township is magnificently huge), and it is located right next to the regional high school, which for some parents means concerns about their young children being exposed to “the big kids” and their sometimes worrisome activities, like smoking and whatnot, earlier than they would really like. The meeting takes place in the gym of that high school (Centre Hastings Secondary), 129 Elgin St., Madoc, beginning at 6:30 p.m. As bad luck would have it, there is a freezing-rain warning in effect for Tuesday evening here in eastern Ontario. But people, please try to come if you can. It is so important to show the powers that be how much we care about our school, how important it is to our lives, our families and our community. I will be there, and I sure hope you will too. But on to those words from another writer that I mentioned. Here is a letter that my friend Grant Ketcheson of Madoc Township sent this past week to the new chair of the Hastings Prince Edward District School Board (and copied to our local trustee on the board, Bonnie Danes, a former teacher at Madoc Township Public School). Grant’s family, the Ketchesons, is one of the oldest in Hastings County, and he himself is a walking repository of local history – and by that I don’t mean just dates and names, but living history: knowledge and stories about how things were done in rural areas once upon a time, and how things changed over the years, and how that all turned out and is still turning out. He well remembers the establishment of Madoc Township Public School, and knows as much as anyone does about its importance to our community. Here (with Grant’s kind permission) is his letter. He says it better than I ever could. I will wager that the mandarins in the Belleville office moving their educational chess pieces around have never visited the school communities that they are about to destroy. Yes, in rural areas, these are not just schools, they are school communities! I would also wager that these same mandarins have never driven on Baldwin or Elgin Streets in Madoc at bus time. It is a scene of chaos. Now they are planning to add to this with more buses! Perhaps when you are disrupting a whole community, it is easier to be like military drone pilots who don’t have to go anywhere near the damage they create. In an era when we are becoming increasingly alarmed at the level of inactivity and obesity in our children, it makes little sense to close an educational facility like Madoc Township School with a spacious 5.5-acre playground that includes a ¼-mile running track. Apparently we are now preparing to lose this unique location and move students to Madoc Public School with a fenced-in area not large enough to be enjoyed by all students at the same time. Certainly, the wire fence makes a great place on which to lean while exercising thumbs on a wireless device! What the experts from the board office fail to realize is that once we lose large playground areas, we can never get them back. My wife, a teacher for more than 35 years, has been on yard duty in more than a half-dozen school yards. She can attest to the difference in behaviour when children have plenty of room to run, play and just be kids. Madoc Township School is one of the very few in existence that has the luxury of lots of playground space. It would seem to make more sense to reverse the decision, made some years ago, that took grade 7-8 students out of the school and sent them in to Madoc. Certainly the school is in excellent shape as it has had a new roof and all new windows in the last two years. Of course, we were not thinking of any realignment of schools when that money was spent, were we? It would behoove administrators and decision makers to visit schools such as Madoc Township School before they destroy them, just to see what kind of facility they have. We personally know young couples who have moved to this area to live in a rural setting and to have their children attend a school in such a unique setting. Not to mention the fact that recent EQAO ratings rate this little school highest in Hastings County. It might be a good idea for board members to have a look at the value of a the target before they let the drones destroy it! Readers: I hope to see you tomorrow (Tuesday) evening for that meeting at CHSS. Let’s show we care about our community school and that we want to see it – and our community – survive and thrive. 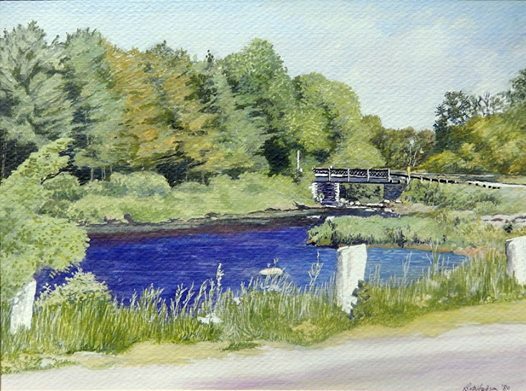 The bridge over the Black River in Queensborough as seen through an artists’s eye – that of Bob Hudson. This gouache is called Queensborough, 1980. Copyright, and used by permission of, Bob. Isn’t it beautiful? Remember my post last night, featuring one of my own typically inexpert photos of the pretty scene in downtown Queensborough that features the bridge over the Black River (and my friend Graham’s collection of colourful Adirondack chairs)? If you don’t, check it out here; and after you do, I hope you will marvel at how a real artist has brought that same scene to beautiful life. The picture at the top of this post is by artist Bob Hudson, and it is a gouache done way back in 1980, when Bob and his family lived in nearby Madoc. As luck (or fate, or whatever you want to call it) would have it, he posted it on Facebook a few days ago – and as you can imagine, I was thrilled to see it. I inquired of Bob whether it would be all right to feature his beautiful painting here at Meanwhile, at the Manse, and he very kindly gave me permission. Thank you, Bob! I’m sure a fair number of my readers, especially those with ties to the Queensborough-Madoc area, will know Bob, or at least know of him. He and his family moved to Madoc (from the Toronto area) in the early 1970s, and he was well-known as a fine artist and potter. His family and ours (when I was a kid growing up at the Manse in Queensborough) knew each other a bit, and it is so nice to reconnect after all this time – especially over a picture of Queensborough! Bob now lives (and paints) in Toronto, but the very fact that he posted this great picture suggests to me that he has fond memories of his time in this area. I am so happy to be able to show you this picture. And it makes me think – and not for the first time – how wonderful it would be if we could put together even some of the many artistic works that have been done in, and inspired by, our historic and pretty hamlet over the years. Here is a post that I did quite some time ago that tells about the Schneider School of Fine Arts that was located in the nearby Elzevir Township hamlet of Actinolite back when I was a kid, and from which groups of artists would regularly come on excursions to set up their easels and paint scenes of Queensborough. Oh, to be able to find even a few of those paintings and sketches now! But you know, now that I reflect on it: maybe the serendipity of Bob posting that picture and giving me permission to share it when I found it, and thus giving me occasion to ruminate (as I now am) about somehow finding and showing Queensborough-themed art – maybe this is a start! Could we make it happen? Question 1: What’s the story on that great house? Every time I drive through the hamlet of Actinolite, which lies between Queensborough and Tweed and is in fact the only community in Elzevir Township aside from Queensborough, I admire the magnificent and unusual stone house that you see pictured at the top of this post. It’s perched in a great spot on a hill overlooking the hamlet, and it’s really an extraordinary-looking – and obviously historic – place. I’d love to know the story behind who built it, what that golden-coloured stone is and where it came from, and who has lived there over the years. Question 2: Was this house (or this site) once the Green Acres restaurant and campground? 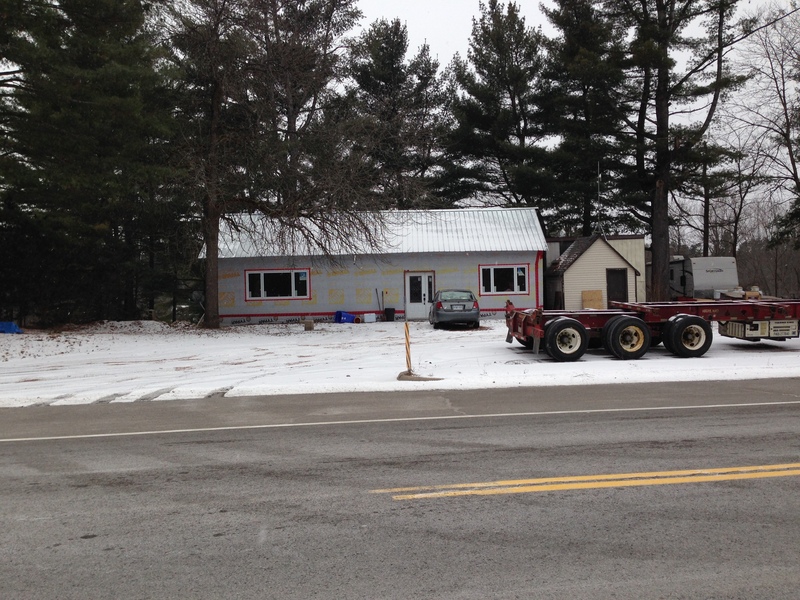 Toronto man has acquired “Green Acres” … Norman De Piedro of Toronto, brother-in-law of James Mayo, of Jimmy’s Drive-In Restaurant, Actinolite, has purchased the Green Acres restaurant and cabins on No. 37 Highway, just south of Actinolite … The DePiedros expect to have the premises open for business within a week. Now, my question (aside from: Jimmy’s Drive-In? Never heard of it) is this: every time I pass by the house in my photo, or at least the site that this house is on, I get the feeling that it was Green Acres. Was it? Oh, and hey – does anybody have any photos of Green Acres (or, for that matter, Jimmy’s Drive-In) when it was in operation? Question 3: Was this ministry that ministry? All the time I was growing up in Queensborough, there was an office of the Ontario Ministry of Lands and Forests – the name was later changed to the decidedly less poetic “Ministry of Natural Resources” – somewhere in the vicinity of Tweed. I was never at that office, and in truth have never been sure of where exactly it was, but I know that the operation was a fairly big employer in the area at that time. 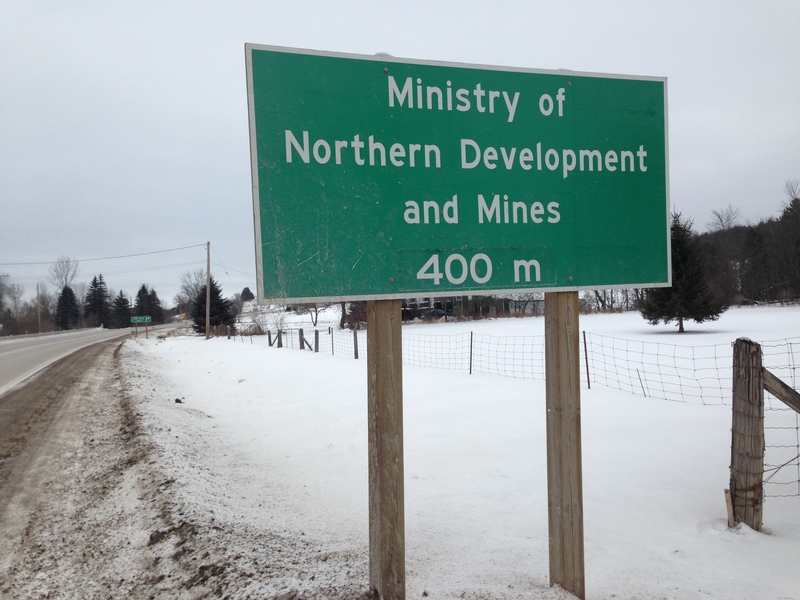 These days there is an office of the Ontario Ministry of Northern Development and Mines, which I know only because of this sign that I pass when travelling to and from Tweed. One of these days I’ll take the time to drive in and see what’s doing at that office, but in the meantime, my question is this: is the setup now occupied by the Ministry of Northern Development and Mines the same one that used to be the Lands and Forests? And finally, Question 4: Why doesn’t somebody buy and reopen this former antiques and collectibles emporium? I still remember the first time Raymond and I drove past the Bridgewater Trading Corp., right after we started visiting this area and were considering buying the Manse. It was a sunny day. I saw the sign and the fairly expansive setup of buildings from afar, and my heart leapt: an antiques emporium! Raymond and I love those places, and visit them whenever we can – often when we’re on holiday down in New England. (They have great antiques barns there, from which have come many of our treasures – see posts here and here and here, for instance – including a made-in-Canada vintage wooden toboggan.) What a thrill to find one in Tweed! But alas, it was not to be. 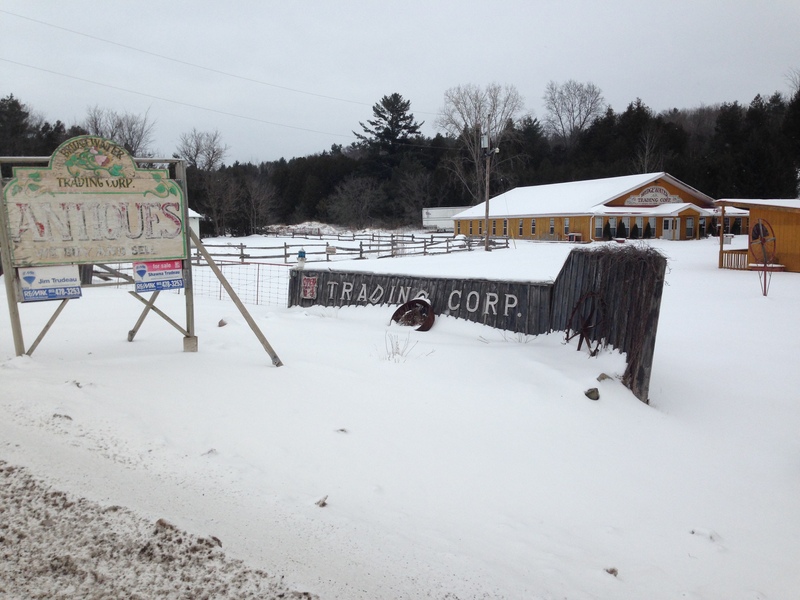 The Bridgewater Trading Corp. was closed (I don’t know when) and was for sale. And four or so years later, it’s still closed, and still for sale. That makes me sad every time I go by it, and it made me sad again today. I just know how much fun Raymond and I could have looking through the vintage wares (including the junk, of course) that a multi-vendor facility like that would have. So final question: Future Tweed antiques-emporium operator, are you out there? This is the 18th-century building on rue Elzevir in Paris where there’s an apartment for sale for a mere €1,295,00 (about $1.8 million Canadian). It’s a little different from our Elzevir, but I’m pretty sure Raymond would love it. Queensborough, our home for this past year (and also my childhood home) is located in the township of Elzevir, as I’ve mentioned many times before. (And if you want to read some speculation on why this rocky part of Hastings County ended up with that unusual name, you can go here.) 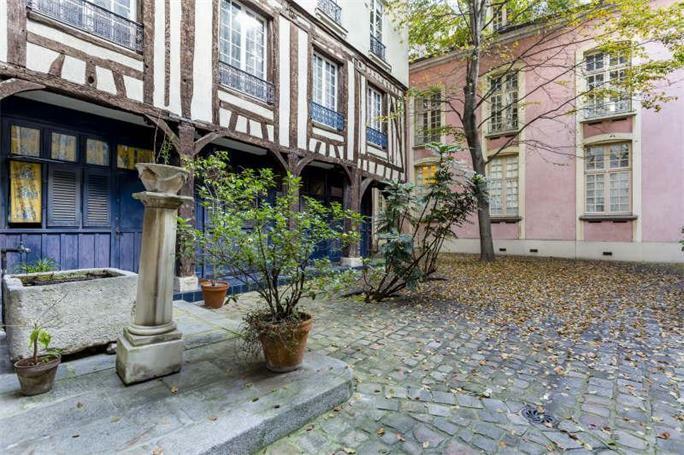 Today when I was looking through one of the latest entries on a Paris-based blog that I really like, called Messy Nessy Chic, I was intrigued to come up with another Elzevir reference: a street in Paris where there’s a pretty nice old house – or actually, apartment – for sale. Messy Nessy Chic is the brainchild of a woman named Vanessa (Nessy for short) who, as far as I can gather, is an anglophone living in, and loving, Paris. She writes about lots of cool things having to do with that most wonderful of cities, and with France; but she also likes, and posts about, many other interesting things, like a temporary hotel in an airplane, and tiny houses, and unusual places, and vintage trailers, and things she found on the internet. Anyway, today she did a post (it’s here) in which she gives ordinary non-rich people like you and me (and her) a glimpse into how the other half lives in Paris: she showed 10 amazing places that are being offered for sale through the Christie’s website. And one of them is on rue Elzevir! Which, despite having visited Paris several times, I had never heard of before. It is, I have now learned, in the Third Arrondissement, in the Marais, and it’s close to the Musée Picasso and the Musée Carnavalet, both of which I have visited more than once. Without realizing how close I was to Elzevir! 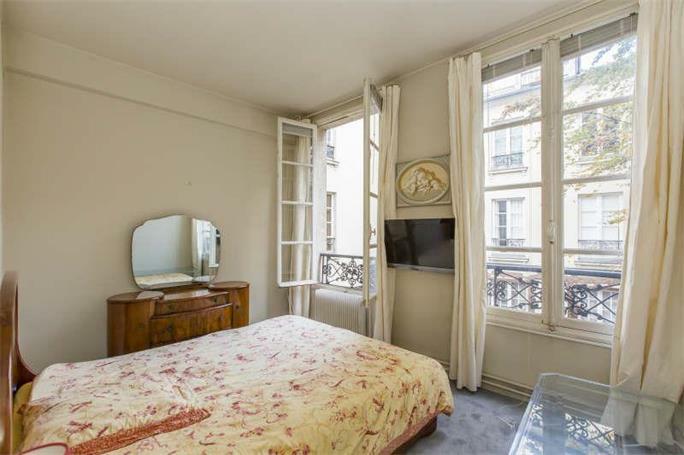 A bedroom on the rue Elzevir. I love that dresser! But even without it, I’d love to wake up here. So what do you think, people? Should we snap up this one on the rue Elzevir, so we can have a foot in two Elzevirs?